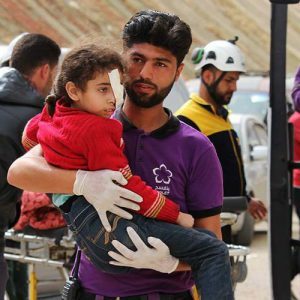 Idlib is a region of Syria where there are more than 2.6 million civilians packed into what is being described as a ‘kill-box’, with the Syrian regime and Russia launching daily aerial attacks. Nearly half of these civilians have already been forced to flee their homes elsewhere in Syria. Facing attacks from all sides, civil society in Idlib continues to operate with remarkable effectiveness and determination. In areas best known internationally for massacres, there are untold stories of hundreds of groups providing the services civilians need to survive. But to look at only the services provided is to miss the point: Idlib’s civil society represents the best chance for free and democratic institutions and its heroes prove that another Syria is possible. To that end, Peace Direct, together with The Syria Campaign, today have launched Idlib Lives: The untold story of heroes, a report exploring the crucial role civil society is playing in Idlib, Syria. The report draws heavily on interviews held with Syrian humanitarian providers and civil society organisations currently based in Idlib who are engaged in significant and innovative programmes in the most challenging of circumstances. The report highlights their unique stories and sets out key recommendations for those in the international community who have capacity to support civil society in Idlib.